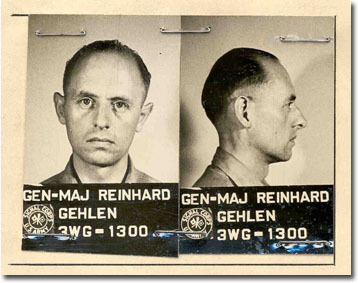 Gen. Reinhard Gehlen persuaded the U.S. Army and then the CIA to sponsor his intelligence network even though he employed numerous former Nazis and known war criminals. "This secret CIA history is full of documents we never would have seen under the Freedom of Information Act, because Congress in 1984 gave the CIA an exemption for its 'operational' files, on the grounds that such files were too sensitive ever to be released," commented Thomas Blanton, director of the National Security Archive. "The Nazi War Crimes Disclosure Act has proven this assumption false. Release of these files has done no damage to national security, has provided information of enormous public interest and historical importance, and however belatedly, has brought a measure of accountability to government operations at variance with mainstream American values." Note: The following CIA history has been split into separate pdf files for each separate document or volume introduction, due to its large size. It includes relevant documents from the CIA, Army Intelligence, and CIA predecessor organizations. Document 4: Statement of Heinz Danko Herre. April 8, 1953. Document 6: Report of Initial Contacts with General Gehlen's Organization by John R. Boker, Jr. May 1, 1952. Document 8: Report of Interview with General Edwin L. Sibert on the Gehlen Organization. March 26, 1970. Document 9: Debriefing of Eric Waldman on the US Army's Trusteeship of the Gehlen Organization during the Years 1945-1949. September 30, 1969. Document 10: Seventh Army Interrogation Center, "Notes on the Red Army-Intelligence and Security." June 24, 1945. Document 14: SAINT, AMZON to SAINT, Washington, "Russian Experts of German Intelligence Service." January 8, 1946. Document 15: Headquarters, US Forces European Theater (USFET), Military Intelligence Service Center (MISC, "Operation of the Blue House Project." May 11, 1946. Document 16: Headquarters, USFET, MISC, CI Consolidated Interrogation Report (CI-CIR) No. 16, "German Methods of Combating the Soviet Intelligence Service." June 3, 1946. Document 17: Headquarters, USFET, MISC, Lt. Col. John R. Deane, Jr. to Assistant Chief of Staff, G-2, USFET, "Plan for the Inclusion of the Bolero Group in Operation Rusty." July 2, 1946. Document 18: Lewis to Chief, Foreign Branch M (FBM), "Operation KEYSTONE." September 9, 1946, enclosing Lewis to Brigadier General Sibert, G-2, September 6, 1946. Document 19: Maj. Gen. W.A. 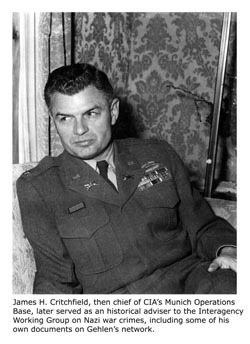 Burress, G-2, to Lt. Gen. Hoyt S. Vandenberg, Director of Central Intelligence, "Operation RUSTY - Use of the Eastern Branch of the former German Intelligence Service." With attachments. October 1, 1946. Document 21: Draft to Deputy A, "Operation Rusty." October 16, 1946. Document 22: Galloway to DCI, "Operation Rusty," October 17, 1946, enclosing Heidelberg Field Base to Chief, IB, "Agent Net Operating in the Bamberg Area," with attachment, September 17, 1946. Document 23: DCI to Maj. Gen. Stephen J. Chamberlin, Director of Intelligence, War Department, "Operation Rusty-Use of the Eastern Branch of the Former German Intelligence Service," November 20, 1946, enclosing Burress to Vandenberg, "Operation RUSTY-Use of the Eastern Branch of the Former German Intelligence Service," October 1, 1946. Document 24: Col. W.W. Quinn to Galloway, "Operation RUSTY," December 19, 1946. Document 25: Helms, Memorandum for the Record, "Operation RUSTY." December 19, 1946. Document 28: Lt. Col. Deane to the German Chief of Operation RUSTY, "Assignment of Responsibilities," February 25, 1947. Document 31: Report, "Operation KEYSTONE." March 13, 1947. Document 34: Memorandum to Helms, "American Intelligence Network," with attachment. March 18, 1947. Document 37: Report, "American Intelligence in Bavaria." March 29, 1947. Document 38: SC, AMZON to FBM for SC, Washington, "KEYSTONE: LESHCINSKY." March 31, 1947. Document 39: Memorandum to [Galloway] and Bossard, "Evaluation of RUSTY CI Reports," with attachments. April 1, 1947. Document 42: Bossard to DCI, "Operation Rusty." May 29, 1947. Document 43: Galloway to DCI, "Operation RUSTY," June 3, 1947, enclosing Bossard to DCI, "Operation Rusty," with annexes, May 29, 1947. Document 45: DCI to Secretary of State, et al, "Opertation Rusty," [undated], enclosing "Memorandum on Operation RUSTY," June 6, 1947. Document 50: Galloway, Bossard, Helms, "Report of Meeting at War Department 26 June 1947." June 26, 1947. Document 51: Bossard, "Recommendations drawn up at request of Gen. Chamberlin for the attention of Gen. Walsh." June 27, 1947. Document 55: Chief of Station, Heidelberg to FBM, "RUSTY." October 1, 1947. Document 56: Headquarters, First Military District, US Army, General Orders Number 54, "Organization of 7821st Composite Group." December 1, 1947. Document 57: Chief of Station; Heidelberg to Chief, FBM, "Russian Newspaper Attack on American Intelligence Activities," with attachment. February 6, 1948. Document 58: Memorandum to Helms, "Operation RUSTY," March 18, 1948. Document 59: Helms to ADSO, "Rusty," March 19, 1948. Document 60: Chief, Foreign Broadcast Information Branch to ADSO, "PRAVDA Report of US Spy Group in USSR Zone of Occupied Germany." March 30, 1948. Document 61: Chief, FBIB to ADSO, "PRAVDA Report of US Spy Group in USSR Zone of Occupied Germany." March 31, 1948. Document 62: Chief, Munich Operations Base to Acting Chief of Station, Karlsruhe, "Rusty." July 7, 1948. Document 63: Acting Chief, Karlsruhe Operations Base to Chief, FBM, "RUSTY." August 19, 1948. Document 65: Chief of Station, Karlsruhe to Chief, FBM, "RUSTY." October 15, 1948. Document 67: [Helms] to COS, Karlsruhe, "RUSTY." November 2, 1948. Document 68: [excised] to COS, Karlsruhe, "RUSTY." November 18, 1948. Document 69: Chief, MOB [Critchfield] to Chief, FBM, "Bi-Weekly Letter," (excerpts), December 4, 1948. Document 72: Chief, MOB [Critchfield] to Chief, OSO, "Report of Investigation-RUSTY," with annexes, (excerpts), December 17, 1948. Document 73: Galloway to DCI, "Recommendations in re Operation Rusty." December 21, 1948. Document 75: Chief, FBM to COS, Karlsruhe, "Operation Rusty." December 24, 1948. Document 76: Chief, FBM to COS, Karlsruhe, "Operation Rusty," December 28, 1948, enclosing DCI to Maj. Gen. William E. Hall, USAF, "Operation Rusty." December 22, 1948. Document 77: Maj. Gen. S. LeRoy Irwin to DCI, "Operation 'RUSTY.'" January 19, 1949. Document 78: Helms, Memorandum for the Files, "Operation Rusty." February 1, 1949. Document 79: Chief, FBM to COS, Karlsruhe, "[Gehlen Organization]," February 2, 1949. Document 82: Chief, FBM to COS, Karlsruhe, "[Gehlen Organization]," February 9, 1949. Document 83: Chief, FBM to COS, Karlsruhe, [untitled], February 10, 1949, enclosing Alan R McCracken, ADSO, to Irwin, "Operation Rusty." February 9, 1949. Document 84: [Critchfield] to Chief, FBM, "Letter to General Hall," with enclosures, February 10, 1949. Document 85: [Critchfield] to Chief, FBM, "[Gehlen Organization]: Procedure for Handling Funds. March 14, 1949. Document 87: [Critchfield] to Chief, FBM, "[Gehlen Organization]: Current Financial Situation." March 21, 1949. Document 88: Executive Officer to Chief of Operations and Chief, FBM, "[Gehlen Organization]," April 1, 1949. Document 89: [Critchfield] to Chief, FBM, "[Gehlen Organization]: Current Situation." April 18, 1949. Document 90: Robert A. Schow, ADSO to Director, CIA, "EUCOM Support for the 7821 Composite Group (Operation Rusty)," April 21, 1949. Document 91: [Critchfield] to COS, Karlsruhe, "Organization and Individual Security Problems [Gehlen Organization] Staff," May 4, 1949. Document 93: [Critchfield] to Chief, FBM, "Basic Agreement with [Gehlen Organization]," June 13, 1949. Document 94: [Critchfield] to Chief, FBM, "[Gehlen Organization] General Policy," with enclosures, July 7, 1949. Document 95: [Critchfield] to Chief, FBM, "Basic Considerations in Reviewing the Concept and Mission of [Gehlen Organization]," September 21, 1949. Document 96: [Critchfield] to Chief, FBM, "[Gehlen Organization] - Schneider's Negotiations with Third Parties," September 22, 1949, enclosing [Critchfield] to Dr. Schneider, "The Coordination and Control of Negotiations with German Political and Economic Circles and Representatives of Western European Intelligence Services," September 20, 1949. Document 97: [Critchfield] to Chief, FBM, "Dr. Schneider's Reply to Recent Policy Guidance Letters," with enclosures, October 12, 1949. 1. Douglas Jehl, "CIA Said to Rebuff Congress on Nazi Files," New York Times, January 30, 2005.